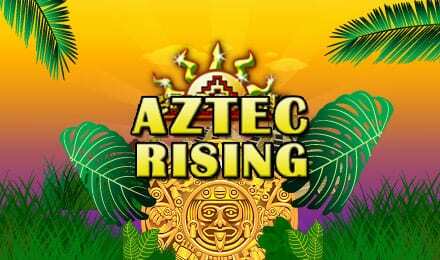 The Aztec civilisation is on the rise led by the brave King Montezuma and it’s your job to help. Stagger your way to the top of temples by risking and sacrificing your free spins to unlock the ancient calendar stone. Who knows what riches lie in the tombs of Mexico. Play the latest online slots like this one today! Founded in 1997 Eyecon is one of the leading developers and producers of high-quality online slot games and scratch cards. With more than 70 hugely successful games, covering demographics from bingo lovers to casino goers and sportsbook players they are sure to have something for everyone. Their games are available across all leading slots online UK gaming platforms and have become a staple for the online casino audience. Joining the Playtech family in February 2017 is not only an example of their growing position in the marketplace but has allowed Eyecon to produce even more high-quality slot games for you to enjoy. Why don't you deposit and play our slot games right away? Welcome traveller, I see the jungles of Mexico have beckoned you to uncover its hidden treasure. Are you ready to venture forth and discover the concealed fortunes? Simply unlock the ancient calendar stones to uncover the mysteries of the mythical Aztec. The temple is located within a picturesque Amazonian jungle, the structure itself has become one with the dense and mysterious landscape below. Natural beauty truly triumphs in this land. Get to know more information as to why this was hailed as the top-rated slot game for new players. From the developer who brought you Fluffy Favourites, Shamans Dream and Irish Luck this 5-reel, 25-win line format looks to be one of the most rewarding yet. To get started in the jungle you must first decide on your initial wager with minimum bets being as low as £0.01 and maximum bets up to £25.00 this experience is truly bespoke to your circumstance. You can then select up to 25 play line by making use of the Line-Up and Line Down buttons - the more you choose the higher your chances of winning. Once you start spinning the wheels will start rolling, slowly revealing the secrets of the Aztecs. If you prefer to sit back, enjoy the stunning scenery and relax this game also has its own auto-play function, in which you can play up to 100 games in a row with a simple click. The most noteworthy symbols within the game include the Temple or your Wild, the Coin and the Calendar Scatters. The Wild can replace any of the other symbols - not including the Scatters - to help increase your chances of completing winning lines whilst also DOUBLING your wins. On top of this aesthetically stunning game, be prepared for several bonuses and big wins including up to 25 FREE games for simply spinning a specific amount of Coin Scatters. Furthermore, spin 3 or more of the ancient Aztec Rising Calendars to activate the magical chamber. But what waits within the ancient chamber? Up to 100x multiplier! This is an adventure of a lifetime. So, what are you waiting for? Your fortune awaits you. Deep in the Aztec rising jungles lies the gateway to your fortune. This game truly has the makings of a classic, from the ancient Aztec motifs to the multitude of potential bonus rounds and extremely generous multipliers we were immersed in this invigorating slot game from the start. The Aztec inspired soundtrack combined with the stunning graphical design allows for that sought-after feeling of escapism. Based on a reign of an ancient civilisation the lush green landscape lifts you to an era where natural beauty prevailed. Once you've had your fill of slots then perhaps give european roulette a try? 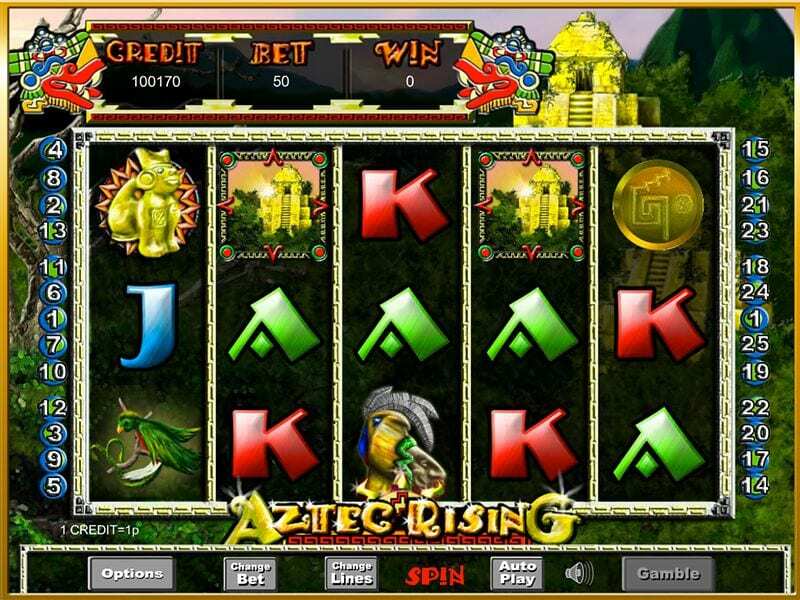 Aztec Gems - Hunt down the lucrative Gems from the ancient Aztec times in this online slot. A journey back to the Mesoamerican Lands filled with exciting gameplay and epic bonus features for you to claim. Aztec Secrets - Flawless graphics and entertaining gameplay. Everything you could ever want from a slot is on offer here. Try it for yourself and find out why this game is so highly rated.